As previously mentioned in our coverage of this year’s Sony E3 coverage, Shenmue III is in the works and in need of crowd-funding in order to come to fruition. 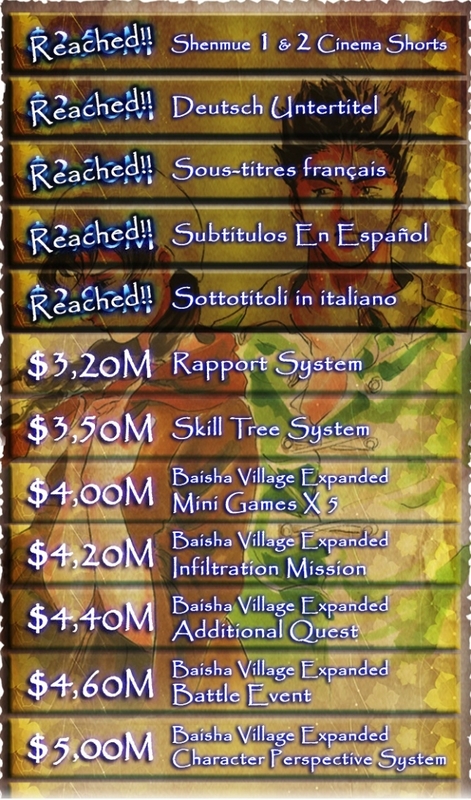 Less than a day after the game’s Kickstarter campaign was announced, the project has now reached its funding target. For those of you unaware, the project was asking for the not insubstantial sum of $2 million. Not only has the project reached this target with 30 days left of the crowd-funding campaign, new backers are continuing to throw money at it and, at the time of writing, the amount raised was just shy of $3 million. This makes Shenmue III one of the fastest growing Kickstarter campaigns to date. We’ve covered Shenmue fans’ fervour for the series before and this merely stands as a further testament to the enthusiasm of the fanbase (considering the fact they’ve been waiting 14 years for a true sequel in their beloved classic open world RPG series makes it somewhat easier to understand). There’s no word yet on the development teams intended release window so watch this space and the official Kickstarter page for more details as they are released. Now tell us what the rapport system is!